During the warm summer months there's nothing like a refreshing cocktail at dusk to celebrate the first days of August. We recently came across an enticing cocktail recipe from Norwegian vodka maker Christiania Vodka, who say their vodka recipe goes back to King Christian IV's court during the 1500's. But feel free to use any high-end vodka, or indeed, this is a delicious recipe without any spirits at all. 1. Pour the vodka, lingonberry syrup and grapefruit juice into a cocktail shaker--may we suggest the stainless steel Nuance shaker? 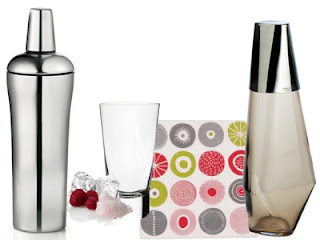 If you would like to make these for a group but don't want to be stuck behind the bar all night, try the Georg Jensen cocktail carafe from our barware collection. And for a festive summer touch, consider our colorful paper napkins by Klippan.